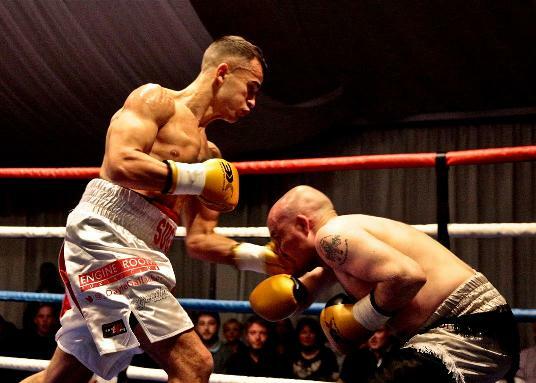 The subject of this interview is Dayle Gallagher, who is proving to be one of the most exciting young prospects to emerge on the Merseyside boxing scene over the past few years. On Friday March 3rd Dayle is set to compete in his toughest fight to date,a six rounder at the Hanger 34 Club in Liverpool, against Belfast’s Michael Kelly, a proven Championship campaigner, who in the past year or so has fought France’s Mohamed Larabi for the WBF International title and more recently Scotland’s Lee McAllister for the WBF Inter-Continental belt, as well as competed on huge televised events in Russia and Sweden. Even though I had been in the ring plenty of times before, my professional debut had me more nervous then any other fight, but the feeling couldn't of been better. The fight didn't last long about 1 minute I think before the referee had to interfere and call a halt to the fight which led to my first win in the professional ranks and is a day I will never forget. It was very hard because I was going through a lot of complications with my promoter at the time and couldn't fight and I thought I might never fight again, but after a long period out, my brother helped me and got me a fight. I knew a lot about Marty and knew it wouldn't be easy knowing how experienced he was, but I wanted to show everyone that even with all this time out how good I can be and got the win and felt like I'd never had time out of the ring. I didn't really believe it was true when I first found out about Pakistan. I had just come back from my holiday and next minute am on the phone to Amir Khan’s uncle about a possible fight in Pakistan. Even though I knew I wasn't at my fittest or at my preferred weight I couldn't miss out on the opportunity so I stepped up two weight classes just for the opportunity. I could never thank the people enough from Pakistan on how they made my time there so welcome, it's a great country with great people even when I fought they where screaming my name, so much so that I thought I was back in Liverpool with a home crowd. If you've seen the whole fight it looks like I wasn't too happy at the end but that's because am a fighter and all I want to do is fight. I trained so hard and felt in the best shape of my life so when the fight was over In 30 seconds it annoyed me but that's just something I have to deal with its boxing and fights can be over with one shot. After watching it back I was happy with my performance and I'm blessed with punching power that can pop someone's shoulder out of its socket with one shot. I know about the people he's fought and what he's achieved I know it will be a tough fight but that's why my team and me asked for the fight. I don't watch my opponents on old fights because they could turn up an box a completely different fight so I like to figure them out when am in there. My favourite has to be Pakistan making history and challenging myself, it was a big risk stepping up two weight divisions but I like a challenge and this is why I'm in this fight game, and also boxing in front of two time World Champion Amir Khan and getting great feedback from him, you can't ask for anything better than that. My fighting style I believe is different to the average British style boxer which I think makes me stand out more, I'm a counter fighter with power, I’m a southpaw and I know I can be a nightmare for any boxer out there on the boxing circuit. I'm in the sport to win titles, it's a dream of mine that I know I can achieve and when the opportunity comes I will take it. Even though I'm the one who gets in there to fight I couldn't do it without my team, from my brother Kyle who prepares me for every fight, to all my teammates at engine room. My friends my family and my girlfriend these all help me behind the scenes when I'm moody from weight cutting and preparing for fight night. But the most important people on my team are the people who believe in my dream and buy tickets off me for my fights, because what a lot of people don't realise without ticket sales fights can't happen and I will always be thankful to every last person who buys a ticket from me! I like to get between 4-6 miles in every morning then I will do abit of bag work and get a sauna, then I will go home and rest then at 10:30am depending on which day Monday, Wednesday, Friday I will be at Engine Room until at least Midday working on my boxing. Tuesday and Thursday I will be at Spartan Dynamic untilMidday working on my strength and conditioning, then I will go and pick up freshly prepared meals from Goodness Grill and then have work from 2:30pmuntil 9:30pm. It's a hard routine to maintain but for my dream it's all worth it. I don't really have a favourite part of training; my favourite part is probably getting told I'm finished because it's really hard work. It’s an addiction training that I couldn't go without, but if I had to choose one thing it would probably be sparring. It's the closest thing to fighting and there's nothing better than landing devastating punches on opponents. Outside of boxing my favourite sport is football, I love to watch my team Everton but any game in general I will just watch for entertainment. Boxing is constantly on my brain when I have spare time I watch boxing videos or talk about it to people who don't really care but it's in my blood and I just can't help it. I find social media is very important these days for professional athletes and I always interact with fans, because anybody who takes time to ask me anything about my career deserves a reply, I'm not a big name in the sport yet so to have people asking me questions about my boxing really means a lot to me. Thank you to everyone who follows my career and believes in me it won't be long untilI’m at the top, thank you.